← Yorkshire Three Peaks challenge. 20°C, bright sun and little wind. Four staff, and five kids from our school went to Matthew Bolton College for a Diamond anniversary of the DofE publicity stunt. Royalty arrived about 11am and we were prepped on what to say. The publicity guy said something about how to answer. ‘Don’t just nod when asked something, you will want to tell your relatives when you get older’. I’m not star struck, I hate all that swooning adoration that the royal family attract. We didn’t vote for them, why should I care about them. They live the life of luxury and privilege at our expense. Don’t ask me to swoon. 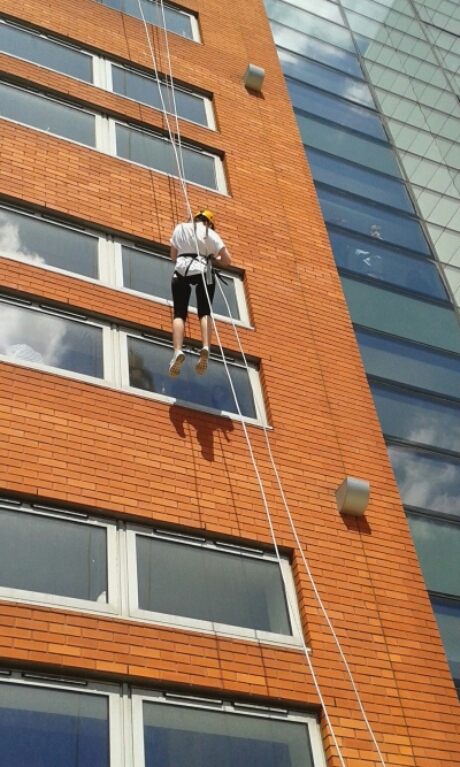 Anyway, the abseil was fine, no hesitation because of height. I felt no fear and I don’t mind looking down. The only awkward moment was climbing over the edge. It’s easier when the rope is fixed higher because you can get your feet up easily. I was able to spring outward to get over the windows. Inside, there are windows sills. Students sat there to spectate so I pulled silly faces as I passed downwards.